This season, I’m going to be writing a weekly column on “DFS Contrarian Plays.” I wrote the same column last season. In an effort to explain what this is and why it matters, I decided to write this piece as a primer to my Week 1 article due out this Saturday morning. The “contrarian strategy” is my preferred method for taking down daily fantasy sports tournaments, or guaranteed prize pools. Someone who is a “contrarian” is defined as a person who opposes or rejects popular opinion. In DFS tournaments, we’re rejecting the most popularly owned players and favoring one to three lesser-owned options each week. The reason for doing so is simple. In a tournament, where the prizes are considerably top-heavy, finishing above average doesn’t help us, and neither (usually) does even finishing in the top 25 percent. We’ll need to try to differentiate ourselves from the rest of the field as much as possible. We’ll also have to be very risk tolerant and take more of a Ricky Bobby-esque “if you’re not first, you’re last” sort of approach. If we roster a highly owned player — let’s say 35 percent of the field is rostering this player — and he has a big week, we’re still neck-and-neck with at least 35 percent of the field. If he does poorly, and we’ve faded him, we already have a leg up on over a third of the field. Basically, we have much more of an advantage if we completely fade that player and just hope he does poorly. The odds that that player hits is always less than the advantage of completely avoiding him. Meanwhile, rostering players below approximately 7.5 percent ownership gives us an equally large advantage over our opponents if that player does very well. We want both underowned players and unconventional lineups in order to separate ourselves from the crowd. It may seem counterintuitive, but we’re not trying to score the most points possible in each and every week, we’re just trying to beat our opponents. I should probably warn you now, however, this strategy is not for the faint of heart, or those who are not prudent with their bankroll. The downside to the contrarian strategy is a higher fluctuation in week-to-week success. We will likely sustain multiple down weeks only to be offset by a much larger profits in just one week. If we wagered the same amount each week in GPPs, it’s very possible we could have four consecutive losing weeks only to be offset by a single lineup winning us hundreds or thousands of dollars in the fifth week. Each week, I’ll list the highest owned players from FanDuel’s Thursday slate of games, and will be recommending that we fade these players and also build lineups around fading them (more on this in a little bit). Last season, FanDuel’s Thursday ownership percentages had a 0.87 correlation between FanDuel’s Sunday slate of games and a 0.84 correlation between DraftKings’ Sunday slate of games. (If ownerships were perfectly the same, we would see a 1.0 statistical correlation.) This is a remarkably high correlation, and especially so for DraftKings’ when we consider the variance in pricing on both sites. Needless to say, I feel very confident using this as the basis of my research each week. After listing the highest-owned players and some arguments against them (and also, typically, after some whimsical and humorous half-related anecdote in the introduction) I’ll list my top contrarian targets each week. These players will all be under 7.5 percent owned on Thursday’s slate. These players might be your typical stud options coming off of a down game (or string of down games) or a lesser-known option in an attractive matchup. In any case, I’ll always walk you through my reasoning for each player. Just because this article comes out after Thursday doesn’t mean you can’t still play slates that include the Thursday game. I typically do play these slates, but am careful to almost never roster a player from these games. These players tend to be over-owned due to casual DFSers wanting some “skin in the game” when they watch Thursday Night Football. We’ll also be targeting players we could use to hedge against the highest-owned players. We’ll look at the highest-owned players and we’ll try to imagine scenarios where they may fail to reach value – or even come close to it (the bigger the bust, the better for us) – and which players instead would benefit from such a situation. Imagine we know Running Back A is going to be very highly owned this week (let’s say 30 percent), then a great contrarian play would be to target the opposing team’s best receiver or running back. We need to think of situations where Running Back A would fail. If the opposing team scored a lot of points, this would cap Running Back A’s usage, as his quarterback would likely be more involved as the team fell behind. How would that team score a lot of points? Likely through their running back or best receiver. This is only one example, and I’ll be sure to go over more throughout the rest of the season. This also works for another reason. We’re typically really bad at guessing who the best plays are on a week-to-week basis. There might be cognitive biases in play here. Perhaps DFS players fall victim to a herd mentality (or groupthink) and are scared of being wrong, or rather one of only a few people who are wrong. More so than that, however, football is one of the most volatile fantasy sports on a week-to-week basis; this is something the contrarian player takes advantage of. 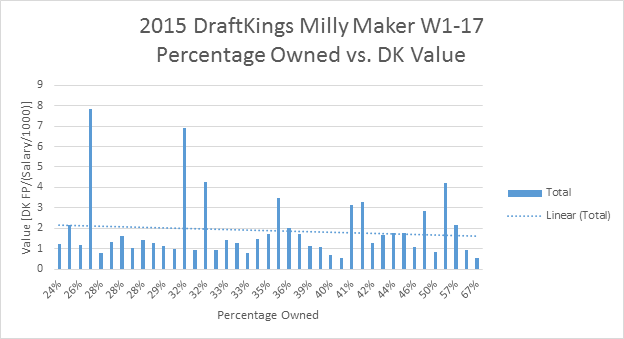 Throughout all of last season, in the Millionaire Maker, there were 41 instances of a player going at least 25 percent owned. Only 10 of these players reached 4x value. So, highly owned (25 percent or more) players, last season, had a hit rate worse, on average, than their ownership. That was eye-opening even to me. Last season, there was actually a negative correlation between value and ownership once a player hit the 25 percent mark. It seems intuitive that the more people are on a player, the higher that chance of him being a value – but that wasn’t the case at all. 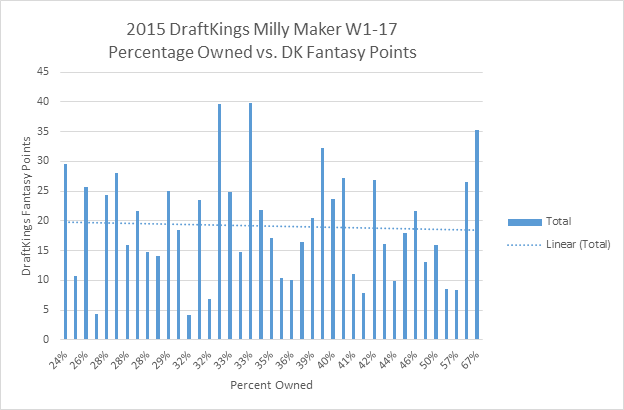 Ownership percentage and total DraftKings fantasy points had a negative correlation as well. Even if highly owned players did have a hit rate closer to their actual ownership percentage, it’d still be worth the risk fading them, because gaining an advantage on over a quarter of the field on only one player is always a smart play in top-heavy tournaments. It’s just surprising how often the supposed top plays underperformed. Here’s an excerpt from my article in Week 10. During that streak, one of our readers even won $4,000 in the Millionaire Maker. Last season, I only wrote up players five percent owned or less, but this season I’ll be bumping that up to 7.5 percent owned. I don’t think much of an edge is lost on 2.5 percent, but it does give me a larger pool of players – and hopefully even more accurate picks. As the season stretches on (shortly after the second half of the season starts), the contrarian strategy loses a slight edge. The larger sample size of data makes everyone a little more accurate, so during that stretch I’ll bump up my pool of players to 10 percent owned or less. I put a lot of hard work into my analysis and research every week. At PFF we have access to the best data and the best rankings. If you have a DFS PFF subscription you’re getting the best advice in the industry. Last season, we had three rankers finish in the top-10 of FantasyPros’ Accuracy Contest. No other site came close. Use our knowledge to your advantage and make some money this DFS season. Good luck.